Armenia struggles with a lack of capacity — human and physical resources — to deliver quality eye care to her people. 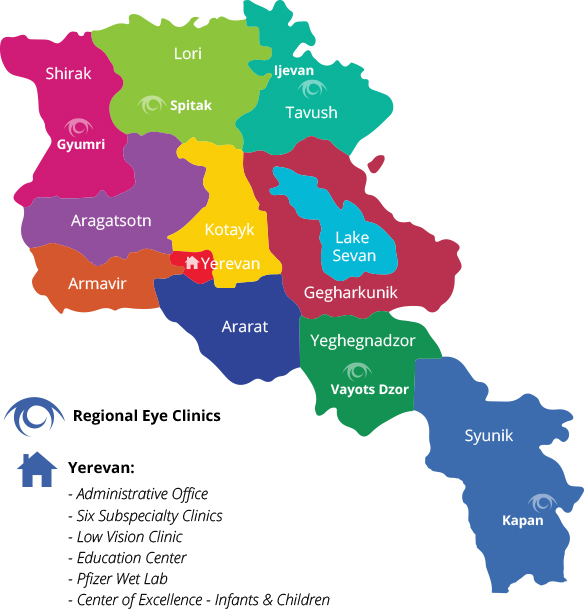 The Armenian Eye Care Project’s major, long-term goal for the country is to develop an eye care delivery system with the capacity to enable the country’s physicians to independently deliver state-of-the-art, quality eye care to the people of Armenia. The EyeCare Project works to accomplish their goal through Medical Education and Training — the cornerstone of our five-point strategic plan — and by developing its physical resources. The Project has always believed that Medical Education and Training will enable Armenia to advance in the delivery of quality eye care to her people and developed a number of programs to provide Armenian physicians with a comprehensive, broad education program. The AECP Fellowship Program began in 1997, and since then the Project has trained eight AECP Fellows in their subspecialties. 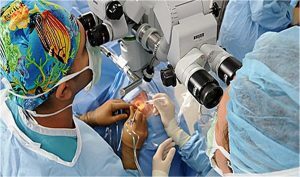 They all returned to Armenia to direct fully equipped clinics in their subspecialty — retina, glaucoma, corneal-uveitis, neuro-orbital, pediatrics, low vision, eye banking and ROP — and to train their colleagues. 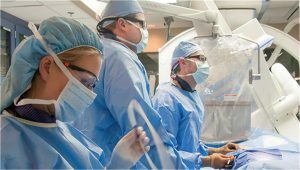 Highly trained physicians, they continue their education with conferences, seminars and other programs each year. 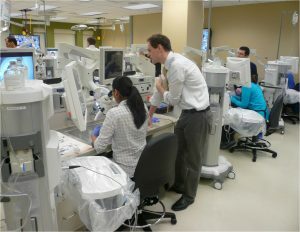 The Project also provides education and training for Armenian physicians in-country — ophthalmologists and other specialties — through telesurgery, online education, an annual conference, courses for neonatal nurses for the ROP Program, training for family physicians and endocrinologists to ensure all patients have access to eye care, Observerships for medical students and residents, and over 50 Medical Missions to Armenia with U.S. volunteer physicians who teach, treat patients and perform surgery. Since 1997, the Project has trained more than 1,000 physicians and 1,400 nurses and other ancillary ophthalmology personnel. 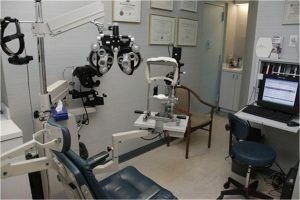 The Project is continually developing Armenia’s physical resources to expand its capacity with facilities and state-of-the-art equipment, which enable them to deliver quality eye care equal to that in the U.S. and other developed countries. This is accomplished by partnering with the Ministry of Health, hospitals and clinics, pharmaceutical and medical manufacturing companies, other NGOs and most important, our donors who fund facilities and equipment. Our first and most exciting facilities expansion in Armenia was the arrival of the EyeCare Project’s Mobile Eye Hospital — a 14-ton, 408-square foot “Hospital on Wheels.” The Mobile Eye Hospital, which traveled on the open seas from Vermont in the U.S., down through Georgia and arrived in Armenia in 2002, has a fully equipped, modern operating room, two examination rooms, a mechanical room and other spaces. The hallmark of the Project, the Mobile Eye Hospital travels throughout Armenia — making a full rotation every two years — to deliver eye care services to an average of 25,000 Armenians annually. The “Hospital on Wheels” provides comprehensive eye examinations, laser procedures and surgery — primarily cataract. Other facilities and equipment, valued at more than $60 million and donated or funded by donors, include a $1 Million Pfizer Wet Lab for training purposes, the Center of Excellence for the Prevention of Childhood Blindness, equipment for eight Subspecialty Eye Clinics, an Educational Center and Library, a Low Vision Clinic, five Regional Eye Clinics, currently in development throughout Armenia and major donations annually of disposable supplies and equipment from Alcon, Allergan, Busch and Lomb, Cal Coast Ophthalmological, Welch Allyn, Zeiss and many others. These generous, in-kind gifts ensure that Armenia’s eye care delivery system and its ophthalmologists have the most up-to-date medical equipment to treat their patients independently and at a level equal to the United States and other developed countries.